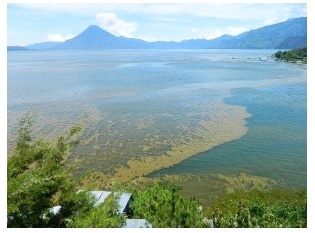 Panajachel, Guatemala – On 3 August 2015, a cyanobacteria bloom invaded Lake Atitlan in Guatemala, the first such occurrence since 2009. An infestation of microalgae is considered a bloom when the concentration reaches 2 million parts per liter, and the tests run by the organizations mentioned below prove beyond a doubt that this is a bloom unprecedented in modern history. The question at hand is: What can we do about it? A series of water samples taken by the Watershed Authority (AMSCLAE) in association with The University del Valle de Guatemala (Altiplano Campus) revealed that there are five major types of phytoplankton in the water, and that three of these (Dolichospermum,Limnoraphis, Microcystis) are classified as cyanobacteria. The eutrophication (excessive richness of nutrients) of the lake is the main cause of this bloom, and if left unchecked, cyanobacteria (in this case Microcystis specifically) will cause the toxification of the lake and make it unsuitable for human use. This has already happened at neighboring Lake Amatitlán, and to lose a national treasure due to ignorance or political incompetence is unconscionable. These nutrients, of course, come in the form of waste water entering the lake untreated, as well as the inappropriate use of industrial fertilizers which then enter the water supply. Therefore, waste management and water treatment are two of the most important issues facing the 15 municipalities in the Lake Atitlán basin. But in an underdeveloped country like Guatemala, where according to Ana Lena Katt, Director of Social Communications at AMSCLAE, there are only waste water treatment plants at 11 of the 15 pueblos in the Atitlán basin, there are both practical and political hurdles to full implementation of a comprehensive water treatment plan for Lake Atitlán. So the first hurdle has been surmounted – the proper official finally released the funding to clean up the lake after the extended bureaucratic idling of two administrations. Now, only four months remain to allocate the funding and begin executing the master plan. Azurdia and his colleagues have been waiting for this day for seven long years. Now, the real work begins to implement a long-term strategy to save Lake Atitlán, one of the world´s natural treasures. Sherm Davis is a writer, musician, and international educator currently living by Lake Atitlan in Guatemala. His self-help novel, entitled Learning to Stutter, is now available online.